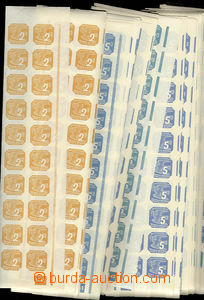 1939 Pof.NV1-9, the bottom bnd-of-20 with plate number L + R, (2, 12, 2, 2, 2, 2, 1, 1, 2) in the middle folded, otherwise nice, cat. over 1200CZK, profitable. 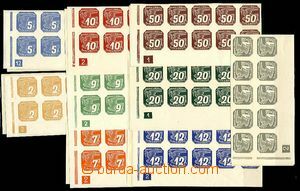 1939 Pof.NV2, the bottom bnd-of-10 S plate number 26-41, 27-42, 29-42, 30-42, 31-42, private perforation various variants, interesting, mint never hinged. 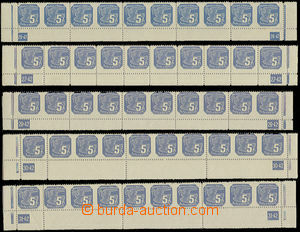 1943 Pof.NV10-18, selection of L and P bnd-of-20 with plate number, nepřerušené also interrupted frames, to set missing only L + R bands by/on/at 5h with plate number 25-44 to 30-44, good quality, cat. 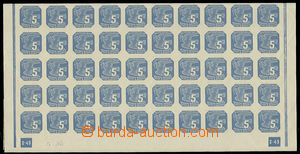 over 5000CZK only after/behind blocks of four with plate number. 1941-44 comp. 7 pcs of newspaper wrappers and cut-squares with Pof.NV2, NV10, NV11, NV7, NV15. Z from-that/of-it/ 2x interesting franking + 1x letter franked with. newspapers stamp. 5h (missing flap). 1942 postcard with mixed franking newspaper stamp. 10h and postage stmp 50h A. Hitler, Pof.NV5, 81, CDS Ústí n./O. 3.XI.42. Without damage. 1943 commercial envelope franked with. newspaper (!) stamp. 5h, Pof.NV11 (private. perf), sent from Prague to Rouchovan, stamp. cancelled CDS Rouchovany 26.VI.43 (incomplete print). Vert. fold envelope/-s. Small usage! 1942 complete newspaper with title side death Heydrich, franked with. newspapers. stamp. 5h, Pof.NV2, CDS Přerov 9.VII.42. good condition, only folded.